WASHINGTON — Some Republican senators defended late John McCain as a “hero” on Wednesday after President Donald Trump again denounced the Arizonan, who died of brain cancer in August. 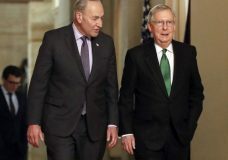 WASHINGTON — Senate Majority Leader Mitch McConnell is skewing facts when it comes to Republican congressional efforts to stem the type of election malfeasance recently seen in North Carolina. WASHINGTON — President Donald Trump’s proposal to reopen the government, with immigration provisions Democrats denounce as inadequate, is headed for Senate action, its prospects uncertain. WASHINGTON — President Donald Trump’s Supreme Court nominee, Brett Kavanaugh, mapped out strategy with Republican leaders Tuesday, launching a fierce confirmation battle that could remake the court for decades and roil the midterm elections in the meantime. WASHINGTON — For Republicans, Senate Minority Leader Chuck Schumer is the face of the government shutdown. For immigration advocates, he’s their best hope.